This past Memorial weekend I was up in Northern Michigan at my buddys cabin and he took me to a little beach around 7 miles away to do some water hunting with my Excailbur II. This is a man made lake and I quickly learned it wasn't going to be easy to hunt because of the clay bottom. Bringing up every scoop was a workout in itself, and then trying to get it to sift was another. The water was still only around 65 degrees so I was wearing my waders. After only a few minutes, one of the locals came up and had told me her neighbors husband only 2 doors down, had lost some gold jewelry 2 years ago out in front of the house in the lake and that I should go talk to her. I told her I would like to help her out, just send her over to me and I'd would like to get some details from her. 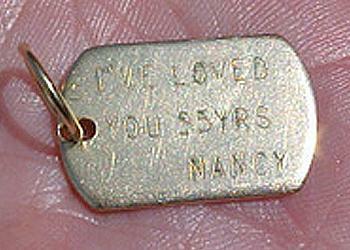 A few minutes later she (Nancy) came by and explained to me her husband (Richard) of 40yrs had lost a gold charm she had custom made for him 15 years ago for their 25th anniversary. 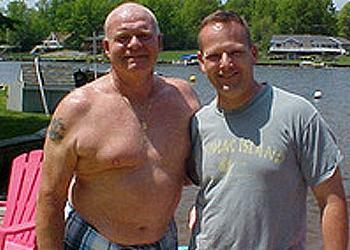 Two years ago, when he was in the lake right out in front of their cottage the chain clasp broke, the big heavy chain and charm went right to the bottom of the lake. 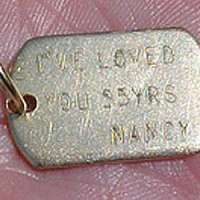 Richard, a Viet Nam Marine Veteran was unable to find the treasured anniversary gift and he and his wife were just sick. Fortunately, Richard knew exactly where he lost it, which was in about 4 feet of water and his next door neighbor ended up finding the chain...but unfortunately no charm. Nancy had showed me exactly where he had lost it, which was about 25ft off the shore, in a washed out area in the clay, and that since then they had dumped around 2 feet of new sand around the first 15 feet off the shoreline. That had concerned me, even though the charm was lost 10 feet beyond the sand. Nancy and Richard had the whole family of kids and grand kids over for the holiday weekend all were really interested in this stranger with the funny looking waders and metal detector. As I got into the area to search, I immediately found the "washed out" area Nancy spoke of. It was literally like stepping into a 2 foot hole under water as soon as I started detecting I got a good signal and thought WOW! I found it already!...Nope, just a part from some kind of motor or something. I kept searching that one area backwards and forwards, digging everything..in the clay and with all the waves from the speedboats almost knocking me over at times and I couldn't see the bottom or even the scoop for that matter. I started to realize that the charm just wasn't there anymore. At about that time the neighbor who found the chain, from next door came over and we started talking. He had told me that he even tried finding the charm once in the winter by cutting a hole in the ice and putting his metal detector down there through the hole. First thing I wanted to know was how he found the chain. And he says "I just saw it on the bottom", and I was like "you can't even see the bottom". Then it was kinda like a light went off, I asked the neighbor "did you find it during the week?" And he says "yeah", well..thats probably why the water was clear right? No boats, no waves...and maybe with all the waves that charm got pushed over the clay and in to the sand. I immediatedly started working back and forth through the rest of the clay digging anything that sounded decent. I had my disc all the way down to hear everything and my sensitivity wide open. Working through the clay was not a whole lot of fun, fortunately there wasn't to much junk. Once I got out of the clay and into the sand, the digging got to be ALOT easier, though there was alot more junk. After about 2 hours I started to lose hope, even though I really wanted to find the thing I wasn't about to give up. Now the water was only just below my knees, and I got a good sounding target, I brought the scoop up to only to find a sqauretab. I took maybe 2 more steps and another good sounding target. This one was deeper though, and sounded like pulltab/gold. I pressed hard onto the kick plate of my scoop, hauled it back up and the sand drained so quick. All I remember was just looking at the bottom of the scoop and seeing in the bright sun this big brilliant gold thing. 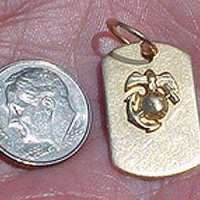 There was writing on it, I didn't bother to read it, I just remember turning it over and seeing the Marine Corp symbol. At about this time Nancy was sitting on the deck talking on the phone and Richard was up on the patio talking with the kids. I just took the charm by the loop and held it high into the air and didn't say a word. I looked at Nancy and she wasn't even paying attention to me, I looked straight ahead to Richard, he looked at me and no doubt could see the gold hanging from my finger tips, his mouth dropped open and his eyes went like golf balls. "IS THAT IT!?" he asks, well I'm pretty sure I said. Now Nancy looks over at me and her face is just in total shock, she immediately hangs up the phone and runs off and into the house. Richard runs over, "I cant believe it!!" he says. "Aaron, do you know how many hours I spent looking for this thing???!" Well, I said you wouldn't have ever found it like that Richard, it was around a foot down, and it was going to sink even deeper." Nancy came back with all emotional, shaking, crying and hugging me, telling me how grateful she was and that she wanted me to take this money she ran into the house for, as a reward. I had explained just the joy of returning it was reward enough (it really was), Richard though, looked at me and said: "Aaron, please". Okay, if you insist, I said. Nancy had told me while I was searching that Richard kept telling her "you know he's never gonna find it'. Heh heh. 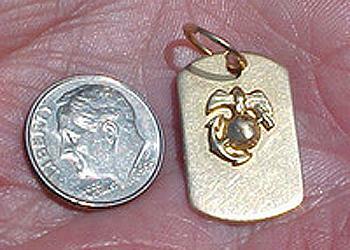 Also, she had paid $300 for the 14kt charm 15yrs ago and considered having another made but not for $800. After I had found the charm, I was really surprised thinking about it, how far that thing had traveled. Not only did manage to work itself out of the 2ft washed out clay hole, it then moved across 10 more feet of clay then onto the sand where it began to sink. I was curious and had Richard hold that big heavy chain out in the palm of his hand and waved my coil over it and it hardly even registered anything. Good thing it was the chain that was found. I think out of all the other gold rings and things I've found over the past 25yrs...this has probably been the best!